These easy grilled vegetable recipes are all accompaniments to other recipes and therefore should be treated as additional things that you can do on the grill when cooking the other parts of the meal. They're not intended as a stand alone meal. If you're lighting the grill then it makes sense to make use of it, right? So these recipes will give you some ideas and help you cook the whole meal outside and that means that you can stay put at the side of your grill (with your beer!). Grilled marinated vegetables don't come any easier than this! Technically a fruit, the zucchini is part of the cucumber family and looks pretty much like a baby marrow. For cooking purposes we regard it as a vegetable and along with all the other members of the cucumber family the zucchini is high in water content. The water in zucchini can also have a bitter taste to it and that's the reason why when we get down to the method statement you'll see that there's a step to "salt" the slices and set them aside for a while prior to cooking. Having taken out the bitterness, zucchini can be beautifully sweet, I love it soaked in olive oil and that's the foundation to this grilled zucchini recipe. 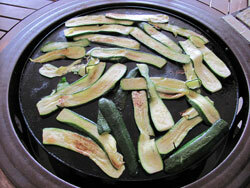 Cut the stalk end off the zucchini and then slice the zucchini length ways. Try to slice them reasonably thinly so that each slice is around 3 or 4 mm thick (one eighth of an inch). Place the slices in a colander and sprinkled liberally with salt then put them to one side for 30 minutes or so with a bowl underneath (or on the sink drainer). When 30 minutes have elapsed you will see bubbles of moisture on the zucchini flesh, that's the bitterness coming out so now rinse all the slices in water. 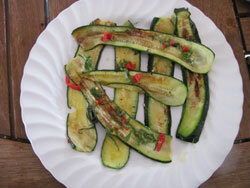 Using a tea towel dry the zucchini and place them in a dish and drizzle with a good lug of olive oil, set aside for a few minutes whilst you prepare the grill. Place the slices on the grill and turn every minute or so to ensure that the flesh doesn't burn. After about 10 minutes you will see that the flesh starts to go semi-translucent and the texture of the zucchini becomes floppy. When this happens they're cooked, they will have soaked up the olive oil and they're ready to eat. Transfer to a warm serving plate and garnish with the chopped red chili. If you say zucchini then this is a grilled eggplant recipe and it's aubergine if you say courgette, but whether you're in America or Europe these grilled marinated vegetables are as good as ever. All it takes is 30 minutes of preparation and 10 or 15 minutes of cooking to complete this recipe and you've got a fantastic accompaniment to any grilled meat. Having chopped off the stalk, slice the eggplant length ways so that each slice is about half a centimetre (1/4 inch) thick. Place the slices in a colander and sprinkled with salt so that you remove any of the bitter juices and ensure that you get a sweet result. This will take about 30 minutes. Once the tears of sweat have appeared on the eggplant flesh rinse the colander under running water and then pat the eggplant dry with a tea towel. 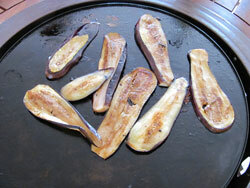 Now brush each side of the eggplant with olive oil and slap them on to the hot plate for about 15 minutes flipping them every minute or so. Once the 15 minutes have elapsed you'll see that the texture of the aubergine has changed completely, the slices appear thinner and the colour is close to grey and partially translucent. There should also be a few brown speckles of caramelizaton signifying that they are now ready to eat, taste them and they'll be beautifully sweet! The essential ingredient in this recipe is sufficient fat to keep the mushrooms moist as they cook. I've chosen to use cheese but feel free to try your own filling vegetarians and carnivores alike. Take the stalk out of the mushroom and chop it finely. In a bowl add the chopped mushroom stalks, tomato, garlic and cheese - give it a good mix. Spoon the mix into the cup of each mushroom and finish of with a topping of freshly grated Parmesan cheese. Brush to outside of each mushroom with a little olive oil (this just stops the outside of the mushroom from wrinkling). 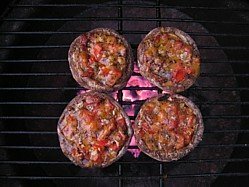 Place the mushrooms on a hot grill and cook for about 15 minutes. You'll know when they are cooked because the mushrooms will have shrunk and the cheese will have melted and started to bubble. Travel to Turkey or Egypt for example you'll see street sellers squatting beside their portable grills with a few corn cobs on them, fanning the fire. To me they looked really dry but when tasted one it was supremely juicy. The principle is to get the sweetcorn to steam in the moisture retained in the husk hence the one hour preparation time. TIP - If you can’t get corns with husks on, what I do is wrap the sweetcorn in foil and before twisting the end to seal it, pour in a little water. If you’re feeling gastronomic, you can use a little dry white wine, to be frank it does little for the taste but it’s a good excuse to open a bottle! Immerse the sweet corns in their husks for at least one hour so that the husks really soak up the water. 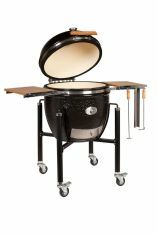 Barbecue on medium coals for 30 minutes and prepare the butter. 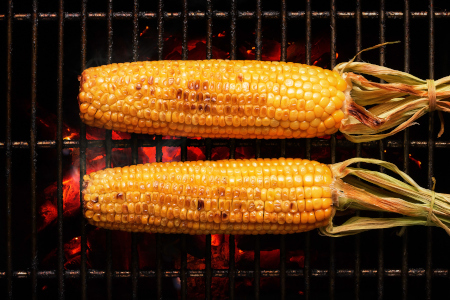 TIP - If your coals are too hot, the husks will dry out too quickly and the kernels will be hard. Gently does it! Melt the butter to clarify it, pour off and keep the clear butter and discard the solids. 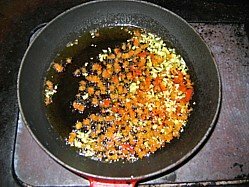 Fry the chillies in the chilli oil for a minute or two, remove from the heat and add the remaining ingredients. Pour in the clarified butter and your done. When the corns are done, pour the butter over – lovely! In the ingredients below, all excepting the potatoes are for the vinaigrette dressing that you'll use at the end to pour over the sweet potatoes. Grilled marinated vegetables at their best...and here's the video to prove it! 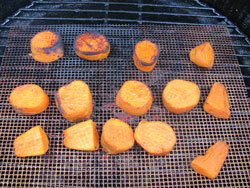 Place the whole sweet potatoes (unpeeled) in a pan of water and bring to the boil. Simmer gently for 20 – 25 minutes until cooked (check with a knife) then strain and allow to cool. TIP - You can do this first step the day before if you wish. Peel the sweet potatoes and make slices about ½ inch (1 centimetre) thick. Now they're ready for the grill. Brush the potatoes with oil and over a hot grill, (I used a Teflon BBQ Mat and brushed that with oil) cook for 7 minutes or so on each side until you get lovely charred grill marks. Serve and drizzle over the vinaigrette. I've put this in the easy grilled vegetable recipes section because I got folks asking me for a recipe but frankly if it were my choice I would have left it out. 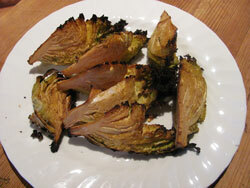 Why oh why do you want to grill cabbage? It doesn't look good, yes' it tastes OK but to be honest it's really not my scene. Ensure there's a bit of the core of the cabbage in each wedge, that way the cabbage stays together and doesn't end up as a load of leaves. Trim the out leaves of the cabbage and give them to your neighbor's rabbit. Cut the cabbage in half and then cut each half into 4 wedges ensuring that there is some of the cabbage heart remaining in each wedge. Mix up the olive oil and lemon juice, place the wedges core side up and drizzle the olive oil and lemon juice mix so that it permeates all the leaves (be generous because it's this moisture that will soften the cabbage). After a good helping of salt and pepper, place the wedges on the grill and give them about 10 minutes on each of the 3 sides of the wedge. Keep brushing more of the citrus oil on the cabbage throughout the cook process because this will continue to add flavor, keep things moist and stop the outer leaves from burning.